John McLaughlin is considered to be a pioneer of minimalism and hard-edge painting. His geometric abstractions are inspired by an interest in the Japanese philosophy of Zen and the idea of the void. Devoid of any rendering of the ‘real’ world, his purely abstract works provoke a state of meditation on man’s place in the natural world. 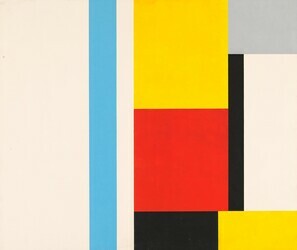 McLaughlin was influenced by Kazimir Malevich and Piet Mondrian, as well as Japanese art and Eastern philosophy. My current practice addressing hard-edge, geometric abstraction, together with a long-standing interest in the Japanese aesthetic, has sparked my interest in the work of McLaughlin. Ellsworth Kelly, Colors for a Large Wall 1951, Oil on canvas, mounted on 64 joined panels. Dimensions: 94 1/2 x 94 1/2 inches. Ellsworth Kelly was a leading exponent of hard-edge painting. Abstract shapes, in this instance the square, are precisely defined and free of gestural brushstrokes. He believed that paintings were objects. Like Kelly, I have been using square panels to create a larger whole. I also wish for my viewer to respond to my paintings instinctively and to experience a physical and mental response. Hilma af Klimt was a contemporary of Wassily Kandinsky, Kazimir Malevich and Piet Mondrian. Today she is regarded as a pioneer of abstract art. Her abstract paintings pre-dated those of Kandinsky, who is historically known to be the founder of abstraction. Like Kandinsky, Malevich and Mondrian, af Klimt’s concern was for the spiritual in art. According to her wishes her works were not seen publicly until 20 years after her death. My interest in af Klimt lies in the fact that it was a woman who painted the first abstractions. af Klimt’s abstractions inform my research into abstract art.